I’ve always been fascinated by the idea of Fashion Week – so many influential people packed into a room, watching straight-faced models storm past in rubber chicken hats or holding their own severed heads. As someone who’s not really into fashion, I think my curiosity stemmed more from the exclusivity of it all, and a burning desire to see behind closed doors. Although runway shows are becoming more accessible to the public, through social media and catwalk live streams, Fashion Week is still for fashion’s elite, and no matter how many runway pics you see or shows you watch, you still can’t get a true feel for what’s behind that red velvet curtain. Explaining this to my colleagues on the Dazed fashion team, they proposed I find out for myself what it was actually all about – and what it actually entailed was far, far different to what I’d previously imagined. And so, at the end of my first (and probs only) glimpse into this exclusive world, here’s what I learned. Take note. Losing your Fashion Week virginity is basically more stressful than losing your actual virginity because you have to wear clothes. Working in the same building as LFW HQ, I’ve seen the crowds that gather and the ensuing photoshoots documenting London’s most style-savvy (and also people wearing rubber gloves as headbands), and I. Was. Scared. As it turns out, though, all the fuss outside is typically kept outside; most people attending fashion week are doing so for work (buyers, journalists etc. ), and will often attend a couple of dozen shows in a day – a task you can’t really do in a duvet (?!) or head-to-toe in blue paint. There are definitely some lewks, but nothing quite as extreme as I expected. Lesson one = complete. Thank God I didn’t wear my condom dress! This is something I already assumed, but it completely exceeded expectations. The three shows I attended – Ryan Lo, Matty Bovan, and Ashley Williams – were all exciting and eye-opening in their own ways. 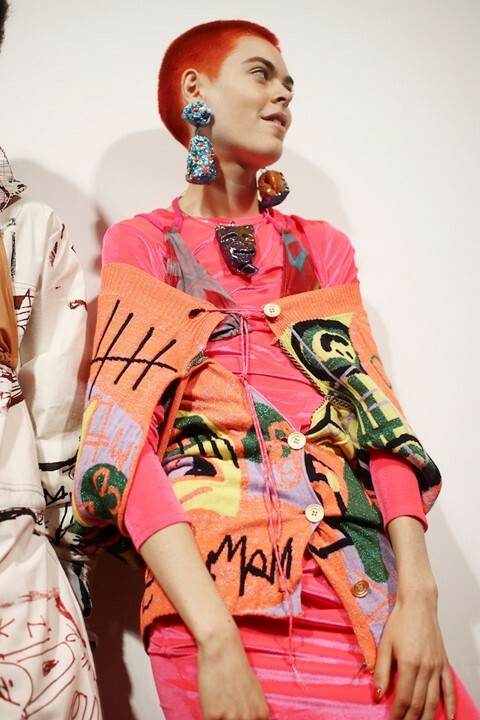 In contrast to Lo’s unashamedly girly collection, Bovan and Williams separately presented bolder, brighter, punkier collections, and these shows were more like what I expected from LFW – dark room, loud music, bright lights. Plus, I saw Vivienne Westwood in the actual flesh at Matty Bovan’s show (swoon). “People think Fashion Week is glamorous,” Ryan Lo told me, “It’s not glamorous.” Backstage with the designer after his fairytale SS19 show; journalists huddled around him thrusting phones to his face, models undressed in a chaotic, brightly-lit room behind us, and Lo’s team shuffled about in headsets guiding rushed attendees to the exit. Of all the things I learned at LFW, the mundanity of it all was the most shocking. Of course the actual catwalk is exciting, but the event as a whole was so normal that it felt as if I’d been attending my whole life. The idea of Fashion Week as a larger-than-life party filled with paparazzi, outrageous outfits and an endless stream of celebs (including the Queen… WTF?) might be true for those attending countless after-parties, but for those working in the industry the reality seems to be long hours, comfortable shoes, and lots of travelling between shows. Another very surprising lesson I learned on my Fashion Week journey is that shows last approximately five minutes. Five minutes! This of course makes sense given there are about 25 looks per show, unless you’re Riccardo Tisci, who presented 134 looks as part of his first Burberry collection (but I’m a fashion novice and they wouldn’t let me attend Burberry, so let’s stick to five mins). Other things that take five minutes include: boiling the kettle, listening to Justin Timberlake’s “Rock Your Body”, moving two centimetres on a London Thameslink train. There are downsides to the fashion industry, most of which are well-documented but never seem to change. One of the things I was certain I’d see was a lack of diversity when it came to body shape, and though I wasn’t surprised, it doesn’t make it any less disappointing to see the same figure strut past you again and again. After LFW came to a close, I reached out to UK-based plus size model Sonny Turner, who walked in Chromat’s NYFW show, who thinks that the catwalk has a responsibility to set an example. “Fashion is changing and people want to see representation,” she told me. “High fashion needs to include more plus-sized bodies, then it will filter down into mainstream.” According to her, no one at London Fashion Week requested to see any plus-sized models. Alongside the likes of Chromat and Eckhaus Latta, Rihanna paved the way for fashion’s possible future at her NYFW Savage x Fenty show. But it’s a shame that, in 2018, this still seems like a radical move.